When I first started blogging almost two years ago, I encountered Jennifer McCann’s Vegan Lunch Box blog. I was inspired by this stay-at-home mom and her lunches, and I looked to her as a model for my own blogging experience. 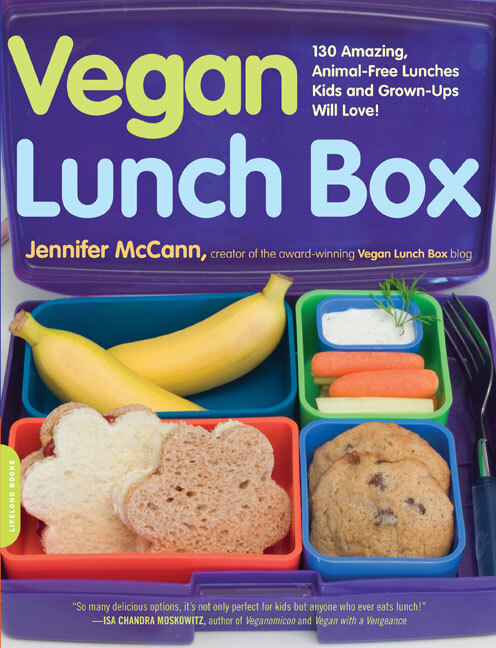 Recently, I acquired Jennifer’s book Vegan Lunch Box: 130 Amazing, Animal-Free Lunches Kids and Grown-Ups Will Love! I am not a vegan, although I have been, but I am a vegetarian. Both of my children have made their own choice to be vegetarian, which pretty much means the National School Lunch Program is not for them, as pointed out by Erik Marcus in the foreward to Jennifer’s book. I am also not much of a morning person, so getting a healthy meal packed for my children each morning is challenging and stressful while making them breakfast. I have found Jennifer’s book Vegan Lunch Box has helped alleviate this problem. I really appreciate the “Allergen-Free Index”. My father is a celiac, and I think all cookbooks should be organized by allergens to simplify the life of someone living with food allergies. For families with allergic children, this is especially important to make the child not feel limited by their diet. Although my children are vegetarian by choice and not based on allergies, they have never felt limited by that choice and relish in delicious meals. Time to go make some kid’s iced tea with apple juice; thanks Jennifer for the recipe! We definitely need to get this book! My kids have (and love) the laptop lunch systems, and are lunches are usually vegan and always free of wheat/gluten and dairy. Although my kids do choose to eat meat, we try to limit our consumption.